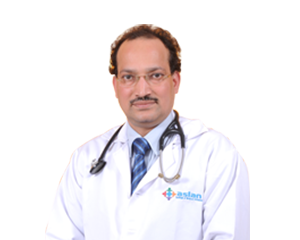 Asian Heart Centre is proud to be one of the most premium hospitals for heart treatment in Faridabad. 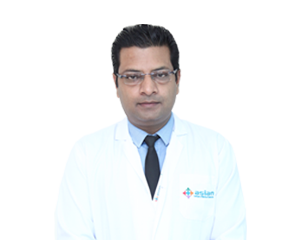 It is also one of the best heart treatment centres in India. The vision of this department is to provide highest quality of integrated cardiac care to the population of this region at acceptance cost with focus on research and education. In a short period of time, the centre has been recognized as the premier cardiac centre of this region through its proficient services and dedication in patient care for cardiovascular diseases and cardiac surgeries. Our centre offers leading cardiac care using cutting-edge technology and clinical innovations in the treatment and prevention of heart conditions. Our core values are quality and excellence at all times. 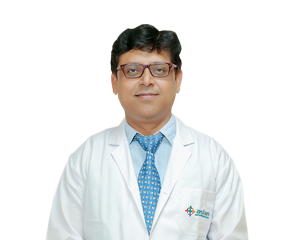 Besides the conventional heart diseases and ambulatory services for cardiac emergencies like cardiac arrest, congenital cardiac disorders, coronary artery diseases, heart rhythm disorder, hypertrophic cardiomyopathy, our team of highly proficient cardiologists and allied staff also provide precise treatment for pediatric cardiac diseases. 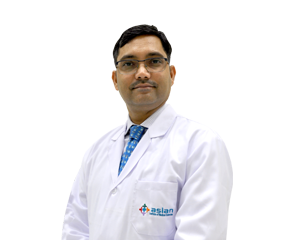 As Asian Heart Centre is expanding and growing, the department takes the pride to announce that on its way to strengthen the cardiology speciality for the service towards mankind, this department is operating as two vertical units. The department consists of Non Invasive Cardiology, Interventional Cardiology and Cardio-thoracic Surgery. 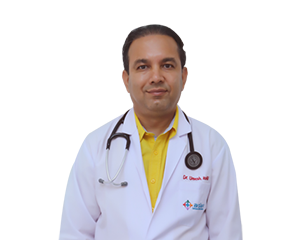 Preventive and Non Invasive Cardiology- Heart treatment is the most dreadful complication of coronary artery disease and prevention and early diagnosis of heart disease treatment is imperative to reduce its complications. 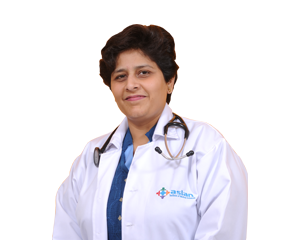 We have latest technology and equipment to diagnose heart diseases at its early stage accurately. 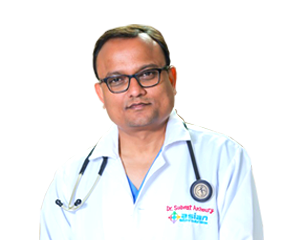 It offers multiple preventive heart check up and comprehensive health checkup programs according to individual person requirement. All Angiographies including Coronary, Peripheral, Carotid, Renal and other special Angiographies including DSA (Digital Subtraction Angiography). 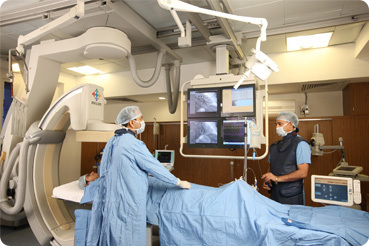 Now preferred approach for coronary angiography is radial route which is easy for the patient. Primary angioplasty for heart attack is available 24 x 7 with an aim of door to balloon time of 60 minutes. Complex Angioplasties like chronic total occlusions, post bypass graft angioplasties or multivessel angioplasties and angioplasties of bifurcation lesions. Balloon Mitral Valvotomy (BMV) is one of the most popular treatments along with Valvotomy of other valves. Pacemaker and device implantations for heart failure. Catheterization Lab (Cath Lab): Our sophisticated Cathlab and advanced technology offers unmatched outcome in various cardiac ailments. The centre is equipped with one of the most advanced Flat panel Philips Allura 20’’ Cath Labs with stent boost and rotational Angiography technology to conduct all type of angiographies and angioplasties including coronary, peripheral, renal, carotids and device closures. This is the only Cath Lab in the region to have intravascular ultrasound imaging system, in which a catheter is passed inside the coronary arteries to take image from inside. 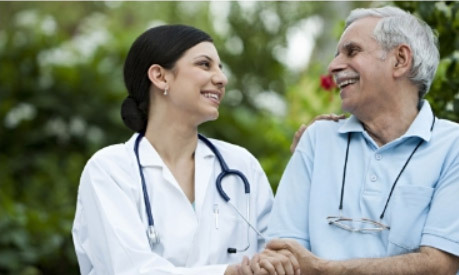 This imaging helps in complex angiographies. 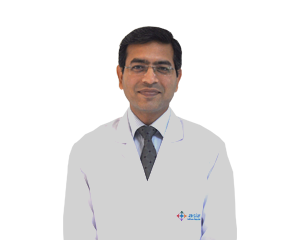 Non invasive cardiology Lab: It is equipped with latest equipment viz. ECG machines, Philips IE 33 Echocardiography (2D and 3D), Trans esophageal Echo, Stress Echo, Philips cordless TMT, Philips Digital Holters, Stress Thallium and PET-CT scan and all types of Doppler viz. renal, carotid, arterial , veinous doppler. 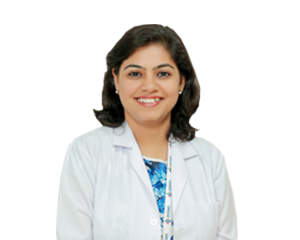 The centre is equipped with state-of-the art equipment for all type of procedures. This is the only centre to have advanced technology like Rotablator, Intravascular Ultrasound Imaging (IVUS) and Fractional Flow Reserve (FFR) measurement. Two modular OTs for performing all kinds of heart surgeries including coronary bypass on beating heart, valve replacement surgeries and congenital heart diseases. Angioplasty & Stenting of Carotid arteries, Renal Arteries.